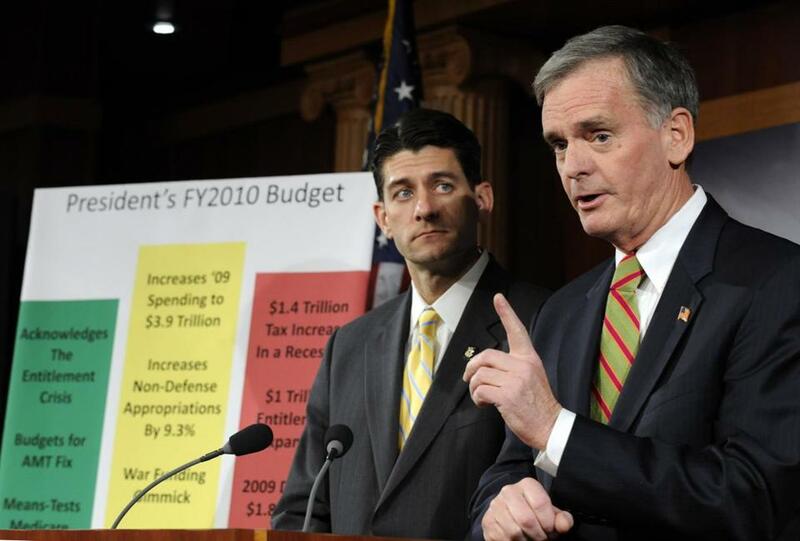 Representative Paul Ryan (left) appeared with then-Senator Judd Gregg at a news conference in 2009 to discuss President Obama’s fiscal 2010 federal budget. JANESVILLE, Wis. — In 2009, as Representative Paul Ryan was railing against President Obama’s $787 billion stimulus package as a “wasteful spending spree,” he wrote at least four letters to Obama’s secretary of energy asking that millions of dollars from the program be granted to a pair of Wisconsin conservation groups, according to documents obtained by The Globe. Ryan’s letters to the energy secretary praising the energy initiatives as he sought a portion of the funding are in sharp contrast to the House Budget Committee chairman’s image as a Tea Party movement favorite adamantly opposed to federal spending on such programs. The documents show that Ryan’s attempts to take advantage of the stimulus funds even after he voted against them was more expansive than previously reported. Ryan was criticized by some House Democrats in 2010 after the Wall Street Journal reported that he was among several Republican lawmakers who sought the stimulus money for their constituents by, in his case, writing a letter in 2010 to the Department of Labor. Ryan’s plan to cut taxes, slash spending, and revamp Medicare represents a doubling-down on Republican supply-side theories and an unprecedented reduction in spending. The additional letters include his praise for the energy program’s aims, and clash with his own budget priorities, which call for curtailing many of the same Department of Energy investments that are designed to spur the growth of green technologies and reduce reliance on fossil fuels. “I was pleased that the primary objectives of their project will allow residents and businesses in the partner cities to reduce their energy costs, reduce greenhouse gas emissions, and stimulate the local economy by creating new jobs,” Ryan wrote to Energy Secretary Steven Chu on Dec. 18, 2009, on behalf of the Wisconsin Energy Conservation Corporation. Ryan’s campaign spokesman, Brendan Buck, declined to comment on Monday, pointing the Globe to the statement from Ryan’s Capitol Hill spokesman at the time of the Wall Street Journal article in 2010. “If Congressman Ryan is asked to help a Wisconsin entity applying for existing federal grant funds, he does not believe flawed policy should get in the way of doing his job and providing a legitimate constituent service to his employers,” the spokesman said. The Romney campaign did not respond immediately to a request for comment. In addition to the appeals for stimulus funds, Ryan also received congressional approval for $5.4 million in earmarks — appropriations by Congress members for specific favored projects — in fiscal 2008, according to Taxpayers for Common Sense, a nonpartisan watchdog group. The requests included $3.28 million for bus service in Wisconsin, $1.38 million for the Ice Age National Scenic Trail, and $735,000 for the Janesville transit system. Stephen Ellis, vice president of Taxpayers for Common Sense, said Ryan “was not a heavy practitioner of earmarks” compared with his Capitol Hill colleagues. But he participated in the process along with other members of Congress, who traditionally win favor back home by providing funds for projects in their districts. In 2005, Ryan boasted in a letter to constituents that he had voted for a five-year federal transportation bill that would provide Wisconsin with $711.9 million, a 30 percent increase, in annual funding for highway projects. That bill, which authorized work paid through the national Highway Trust Fund, included the infamous “bridge to nowhere” in Alaska. John Beckord, president of Forward Janesville, a business advocacy organization, said that Ryan’s support of the auto bailout should be considered in the context of Janesville’s devastating loss when General Motors closed its assembly plant there in 2008. An estimated 5,000 jobs were lost from the plant and supporting businesses. 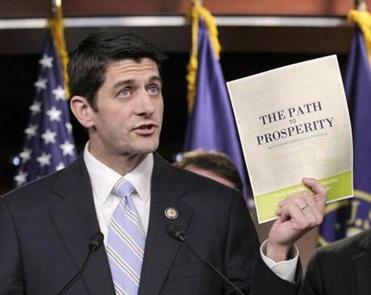 Ryan’s support for the auto bailout did not stop him from striking a stridently negative tone about government spending when the stimulus act of 2009 was being debated, saying it would not work to stimulate economic growth. “This trillion-dollar spending bill misses the mark on all counts,” said Ryan in a statement. “This is not a crisis we can spend and borrow our way out of — that is how we got here in the first place.” But later that year, once the bill was passed and signed into law, Ryan sought to make sure his constituents benefited. 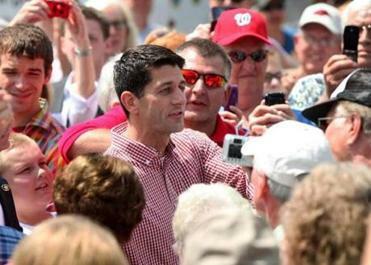 Representative Paul Ryan, Republican vice presidential candidate, campaigned at the Iowa State Fair in Des Moines. On Oct. 5, 2009, he wrote a letter to Chu on behalf of the nonprofit Energy Center of Wisconsin, which was applying for a grant under the Recovery Act’s Geothermal Technologies Program. Under the grant program the center received a total of $240,000, according to its president, Frank Greb. Ryan’s support for the initiatives he championed for Wisconsin is not reflected in his budget plan passed by the House earlier this year. That plan, which did not pass the Senate, would cut the Department of Energy’s discretionary budget from roughly $8 billion annually to $1 billion. Over a decade, the proposal would cut nearly $100 billion from electric vehicle and other energy efficiency programs. Bryan Bender can be reached at bender@globe.com. Brian MacQuarrie can be reached at macquarrie@globe.com.